#1. Making Networking Transactional. Networking is not about shaking hands and exchanging business cards. And, it’s definitely not about asking vendors you don’t know to add you to their preferred vendor partner list. Networking should be the building of a business relationship over time that mutually benefits both parties. #2. Playing the Wallflower at a Networking Event. Riddle me this? Why do some entrepreneurs go to a networking event and sit at a table in a corner all night while chatting it up with people they already know? The whole idea of a mixer or a networking event is to “put yourself out there” and meet new people. 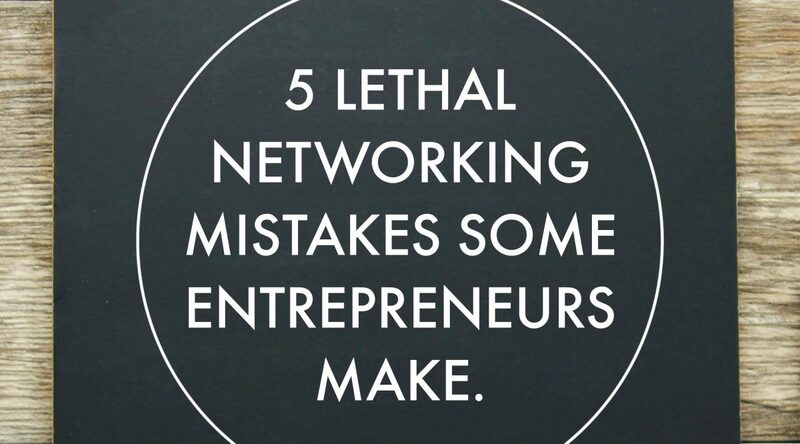 So, go to a networking event make it a point to meet a minimum of five new people. If you are an introvert, I recommend that you arrive at the mixer or the networking event at the actual start time — Networking is less cumbersome if the room isn’t so crowded. #3. Forgetting that You Live in a Fishbowl. We get it — Working with clients and fellow vendors (and even family members) can sometimes be a drag. But, others are watching you and listening to you as you openly complain to everyone about your experiences with a difficult client or an unprofessional vendor partner. And, the other watching you are wondering if they want to network or partner with you at the risk of being the subject of your NEXT public rant! #4. Following a Networking Template. If you are going to a professional conference or a networking event, think of some conversation starters that don’t begin with “Where do you work?” or “What do you do?” It won’t make you stand out to others at all. Instead, try sharing a funny (non-political) story you heard recently. Or, if you read an industry article that you found helpful recently, find a way to share that story in your conversation. Do your homework — If you meet someone who has created a product or service that you love, tell them. People love a compliment, and the chances of the remembering you the next time are much greater because of it. #5. Forgetting to Say Thank You. Over the last 11 years, I have met with a countless number of new entrepreneurs asking to “meet me for coffee’ or “pick my brain.” I believe in the power of “each one, teach one,” so I generously share my time and knowledge to just about anyone who asks. Well, I can count the number of people who thanked me afterwards on one hand! Now, don’t get me wrong – I don’t help others simply for the thank you notes, but a little appreciation goes a long way in the world of entrepreneurship. In fact, I have found that the entrepreneurs who send thank you notes are typically the entrepreneurs with business sustainability. Why? Because they understand how a solid business relationship begins. Kawania Wooten is the principal consultant at Howerton+Wooten Events, LLC. Known to her friends and family as Kay, she uses artistic skills, her keen attention to the smallest details and her strong commitment to customer service as the hallmark of her business. As the founder of the company, Kawania strives for professionalism, creativity and impeccable organization within every function planned by Howerton+Wooten Events.